Before: Ha! OK, so before I started working on this room, there wasn’t much going on. I had a place to do laundry, a bunch of piles of stuff and that was it. What shocks me the most looking back on this before photo is how much space I had in that room that was completely wasted. The shelves were filled with things, but not organized. There was a ton of wall space and a little floor space that wasn’t being used at all. We painted it white and switched out the light fixture when we moved in. But beyond that, zero effort had been made. Its time was coming! First, let’s talk about color. It’s kinda funny because we decorated most of the rooms in our home really quickly, but not this one. I changed my mind on the color in this tiny room so. many. times. We painted, re-painted and re-painted again. I have four colors that are my comfort zone for my home. They are teal, yellow, green and pumpkin orange. I have used the first three a ton so our house kinda matches. I love that, because I can swap couches, rugs, tables and pillows with no problem. But for this room, I promised myself I’d try a new color since it’s kind of a wild card. That was harder than I thought it would be, but I’m so glad I committed to it. I love the peachy color that we chose. Instead of using it on the walls, we used it in three accent spots: the shelves and homemade countertop on the machines, the front of the shelves you can see above, and on the inside of the shelves on the opposite wall, which you’ll see below. We used just enough so that it feels like a lot of color, but it’s still white and bright! As a bonus, if I ever wanted to change colors, it would only take an afternoon to repaint rather than a day or two! We mixed a strong dose of black and white pattern and print into the design as well. We used electrical tape to add pattern to our washer and dryer. This technique is water-resistant, easy to clean and removable. I’m so happy that we tried it, because it turned out to be the perfect solution for us. Fun fact, more than thirty thousand of you guys pinned that little project in the past few weeks! Crazy, right?! I’ve been getting lots of photos of readers trying it and it looks adorable every single time. I’ve even seen some experimenting with other patterns, which is really cool! Yesterday Emma shared the laundry basket shelf that she built for me. This is SO helpful. Adding that little shelf beside the machines gives us a spot to store two baskets of clean clothing and a surface to throw a clean towel on and do a little ironing when we need to. I love that the space is no longer wasted, storage is added, and it’s visually more pleasing as well. So I posted a few sneak peeks of this laundry room makeover on Instagram and I got approximately 8 million comments about how it looks like the swan is pooping. A bit of a facepalm moment for me, but I left it anyway. Oh Instagram! Anyway, the jar of laundry pods has been a helpful solution already. Before, in our messy laundry room, we would have been digging through piles trying to find the laundry soap. Now it’s just there, lookin’ pretty! Our other frequently used cleaning supplies are in arm’s reach as well. On the opposite wall, my dad helped us install peg board. Now that entire space that used to be wasted is used to store cleaning supplies and tools. I used a metal box from a flea market to create a little first aid kit, since I always forget where our band-aids are. Something that isn’t pictured that I still want to mention is a second pegboard just outside our laundry room in the mudroom that is now being used to store pots and pans. It looks just like Emma’s, but painted white. We needed some more cabinet space in our kitchen, and our pots and pans were always super hard to find because they were stuffed into two lower cabinets. That solution has been really helpful for our situation. I wish I would have done it sooner. Thanks, Dad!! Here are a few more photos of the room. There is a designated spot for dog bones, spray paint, paint brushes and board games. Any shelf space that wasn’t being used is now holding extra paper towels and toilet paper. As a naturally messy person, I’m proud of our new tidy space! Our new laundry room isn’t perfect, but it makes me smile when I walk in now, so I think it’s reached its full potential. A+ for you, laundry room! Etsy Art Sources// If you want to be happy/Maridee Studio, Oh Darling banner and Yes, Yes, Yes/Fifi Due Vie, Rain drops/Ashley G.
Credits// Author: Elsie Larson, Project Assistant: Laura Gummerman, Emma Chapman (and our dad too- thanks, dad! ), Photography: Janae Hardy. Love the black and white! Such a great idea to use tape you can remove later if/when you get a different idea and want to change it around. So cute!!! Oh my gosh, that swan is totally pooping! I’d leave it too and have a little laugh every time I do laundry! This is seriously rad. I mean, adorable design aesthetic aside, I can tell just by looking at these photos that this is a functional room. And then that it’s super cute? Well done, bravo! Super cute! Where did you find the baskets? We don’t have a washer and dryer in our loft and this room makes me drool! Too cute! um, can you come do mine? this is perfect! my laundry room is also the door to the backyard and shares space with the dishwasher and pantry (my house is less than 700sq ft. we had to get creative) and it’s just a nightmare. i don’t even want to look at it! i’m definitely putting your washer/dryer diy on my list. that just makes everything pop! and so fun! I havent seen the poping if it wasnt for you mentioning it.. I love it! I kinda hate when people talking, without having anything nice to say. And i dont think its nice saying that, and maybe make you feel less happy about your new fantastic laundry room! I vert jaloux, would really like one, instead of having my washing machine in the kitchen – not very stylish! 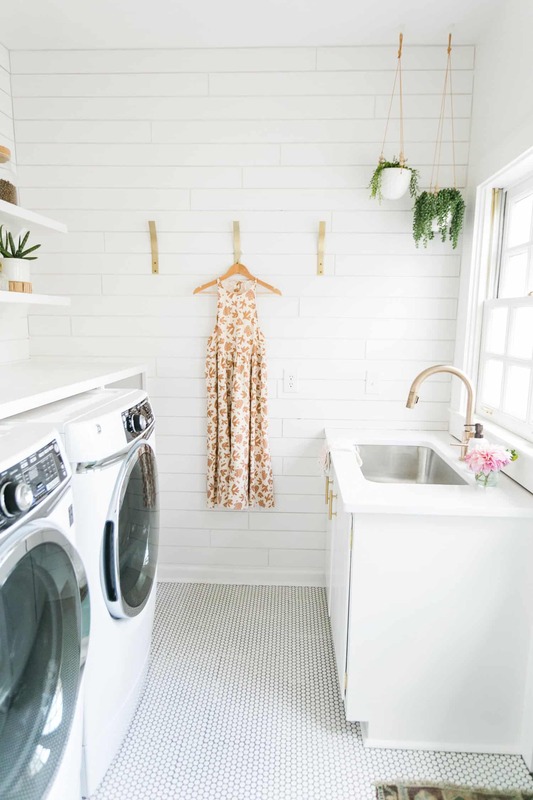 inspiring and cute, it would never have occurred to me to try to make a laundry room cute! also this post is so self-deprecating and funny… that takes a lot of self confidence! Very cute, Elsie! I like it alot! You could switch the the two teardrop faces and the “oh darling” sign. In other words, place the teardrops under the front of the swan and the sign under the back. This would look less, um, poopy, and you still have the darling faces and the sentiment. I’m all for the idea of making the space where I have to do my LEAST favorite chore pretty and pleasant. Maybe then it would be my second least favorite chore, or something. It’s a great little project, especially if you live in a rental space. Everything you did you can take down and with you (except maybe the upper shelves), but it could give any place the perfect little pick me up. Kind of wishing I had a laundry room right about now…ugh nesting mode. I love your house. It feels so comfortable and welcoming. This post makes me look forward to decorating a laundry room when I finally have my own house. Too cute! I love the floor in there. I WISH I had a laundry room. But then what would I do with all the freed up laundromat time..
Hi! Where did you buy your wire baskets? I absolutely love your laundry room! this little space is just too cute! love it! Those washer and dryer are AMAZING! 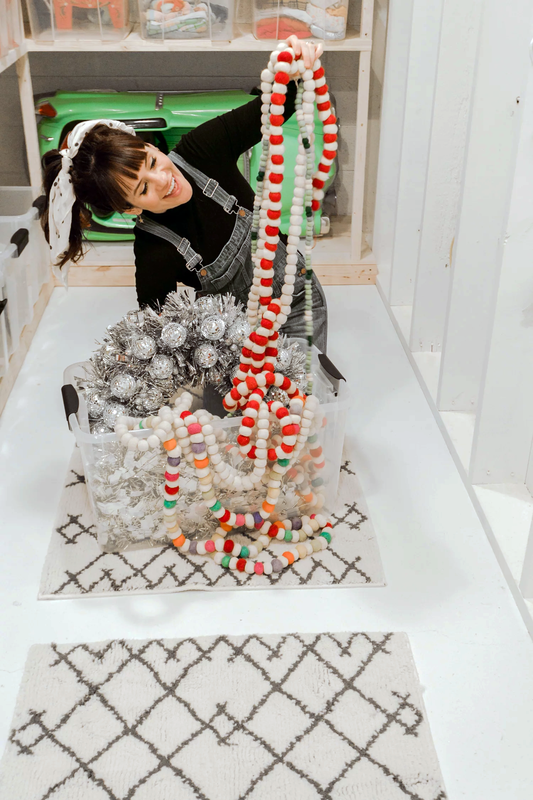 I would never have thought to do spend so much time decorating a laundry room – but why not. Looks fantastic! I love this space!!! I think organized laundry rooms like this can be more helpful than a clean bedroom! I love that you also added personal touches, like the pieces of art that you like. Very awesome. You are so inspiring! I have a holiday break coming up from full time work and grad school and I couldn’t be more excited to just work on my house. Every time I see another one of your brilliant ideas I look at the calendar count down. Your ideas rock…who cares about the swan when you have an awesome peachy colored laundry room. This room looks amazing! All of the little touches can really change the whole dynamic of the room, and i love how organized it is! Fabulous! How nice! Love the Tolstoi quote! It looks just beautiful. I LOVE the electrical tape on the washing machine, such a cute and easy touch. This is fantastic! I’m inspired to do something with my mess of a laundry room now. Love it! i want to go redo my laundry room now!!!! some simple paint goes a long way! and i love the pods idea. we just switched over so that seems like a really good idea to do! also, where are the s hooks for the pegboards from!? This. Is lovely! Question. Where did you get the crates that are holding TP? Such a great use of the small space! I think it’s super funny about what the people on Instagram said. I think that’s the one danger of having a lifestyle viewed by so many, someone (or several someones) are always going to find something to say that puts a different spin on what you were going for. I think it’s great that you stuck with what you love. It’s ultimately your space and we’re being graciously let in to it. I really like the overall look of this room! You are so crafty! I wish I could hire you to come redo my laundry room! i love the polka dot covers!! haha- yea. It’s no big deal!! Amazon! Just search “locker baskets”. We’ve used them all over our home for open storage! I have exactly the same problem with this room. Why it’s so hard to keep it pretty and organized?! I am in love with the polka dots and stripes on the washer and dryer. Well done! I love your laundry-room enthusiasm. I must say I don’t share in that and ours is not someplace anyone would want to see. I just hung a curtain to hide it that I pull back when laundry needs doing. It is a cute curtain though! The after photos look amazing! I love the black and white touches, especially on the washer and dryer. “If you want to be happy… be”, that’s a great daily reminder. Great job on your laundry room, the colors and the organization makes for a lovely space. Thank you for posting the link to that poster! I think I’m going to get one this month! Where did you buy the frame for it? when we moved in, there was the nastiest carpet on top of not-cool-retro linoleum that was cracked and flaking up. there was also no washer and dryer and a huge gas line in the floor. since then, we’ve bought front loading machines, put down some not-laminate-looking laminate, added inexpensive cabinetry from lowe’s and painted it, a hanging rod between the wall and the upper cabinet because i HAVE to be able to hang things after i iron, and retro-fitted a pull out drawer for my hidden laundry baskets in the lower cabinets. topped off with two wooden countertops from ikea. other than the washer and dryer, the whole project cost me less than $500 but it looks so nice and i actually don’t mind doing laundry now that i have a place to fold, iron and hang things. i’ve been trying to figure out what to do on the other wall, and now i’m inspired! peg board. wouldn’t have thought of that!!! And i love the black and white stripes… Was that electric tape? I LOVE your laundry room, of course I am not surprised, you girls are my favorite place for inspiration. But I had 2 questions, I have the same casa bella microfiber mop and as adorable as it is, the darn thing gets so wet and just leaves my floors moist for 30 minutes! Do you have the right method to get that guy working perfectly? And, I just adore the fold you did on your dog leash. We just keep ours hanging long right by the door, but I think a cute fold can make things look so much more tidy, is there any simple way you can share your fold? Thank you for all the work you gals do though, it makes me proud to be a fellow woman. I can honestly say I’ve never seen such a beautiful laundry room. Which is your favourite Tolstoy book, out of curiosity? this must be the cutest laundry room ever! though if im honest, even your before picture puts my laundry room to shame with its 70s all over palm tree print wall paper. such an inspiring post! I love the peg board as organization, and the combination of colors. I actually secretly love doing laundry, and my laundry “room” is off my apartment’s porch. The drywall ceiling recently fell down. Still waiting for repairs, but until then, I gaze up into the wooden supports and look at the black mold. I like the formatting of the quote, too, but it’s not actually from Leo Tolstoy, although it is often misattributed to him. looks good, but a bit strange to hang your toilet brush, isn’t it? Our toilet brushes are stored in the bathrooms. What you are seeing here is probably the tile and grout brush, not the toilet brush. Thanks! I am so inspired by your laundry room. I’m moving next week and already dreaming of a new laundry room to decorate. I’m sure it’ll drive my husband nuts. It’s a good thing he loves me so much! Thank you. I didn’t even notice the whole “swan pooping” thing until I read what you put! People can be so silly with their opinions sometimes. You have a great, unique taste and I’m really glad that you share that with everyone. :)Also, where did you buy the little raindrop guys and “darling, let’s be adventurers” flag? Oh, sorry, you posted the art sources! My bad. The quote in your print should read “If you want to be happy, be so” and is actually not a Tolstoy quote, as it should be attributed to Kozma Prutkov, a fictional author/pen name of Tolstoy and some of his cousins. The quote is actually supposed to be more of a “let them eat cake!” kind of quote, an indictment of those who actually agree with the sentiment of the quote. Just, you know, throwing some context in there, since your print is both misattributing and misreading this quote. Where are the jars from? LOVE those. A boring room to an amazing room! How did you get that Leo Tolstoy poster? It’s amazing! Did you make the framed quote from Tolstoy? If so how? I’d love to give that a go. I know it’s pretty simple but I think the finish would get me. I’m moving soon and taking so many of your posts as inspiration to get crafty. always so motivated when i visit your site!! you can never go wrong with black and white. what a lovely space, such good ideas! Please tell me how the peg board is attached to the wall. Do you place thin strips of lumber behind it, then screw it into that? You’d need to screw into studs I would assume. I can just picture maybe a strip of wood about 2″x2″ but the length/width as a stablizer for the peg board. You could always paint it before or after but it looks to me it would be easier to paint before..I am already thinking of items that I could hang up on the peg board besides mop and broom..One would be dust pan and brush, fly swatter to name a few. Have two dust pans, one is an antique metal one and it is the best..I could always scrub it up good and apply a fresh coat of paint for metals. I’m sure I have some spray paint here for that purpose. I have a question for you..is your hot water heater near the washer/dryer on in a separate room? I see you have your spray paints stored above the washer/dryer and I asked that question simply as a safety factor. I hope to purchase a new washer/dryer in 2014 but I have been wanting to have my handyman put up a cabinet to store laundry detergents, etc. There is a single shelf there now and everything seems to fall down. In order to revamp that small laundry area, the washer/dryer will need to be pulled out in order to do it. Usually the company that installs a new washer/dryer will haul away the old. (Hopefully and sometimes they charge a fee)I’d like some new peel& stick tile put down or some cheap linoleum. 1977 Sliding doors to be removed and bi-fold or doors that open out installed. Sounds like a major project that I may forgo because of the inconvenience..but hey, I can dream, can’t I? Это не Лев Толстой (Leo Tolstoy), а Козьма Прутков. Love this room! Great Job! Was wondering did you add the trim to door and what color is the door? Love it !!! I so long for a dedicated area this large for my laundry room. When the home was built, this must have a very modern laundry room. I love Skylands, including this room. Thanks for sharing your wonderful life, it’s one of my morning rituals to visit your blog. Look forward to the coming year.